Make the most of small work spaces with an HP IWC Desktop Mini/Thin Client that lets you create a compact desktop solution by combining a display with your choice of platform and giving you convenient front access to all of its inputs. Save time and work smarter with easy front access to your platform's inputs, connectors, and power buttons. Even better, you don't have to move the entire IWC around during the day to get to them. Run your display and platform cables through the IWC's guides. 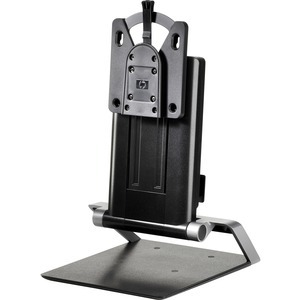 Secure the HP Desktop Mini or HP Chromebox power brick out of the way in the brick holder on the back of the stand. Work comfortably throughout the day. Find your best viewing position with adjustable height, tilt, and swivel adjustment settings. Pair with your choice of display and platform. Enjoy compatibility with a wide range of monitors, including most of the HP Pro and Elite portfolios and an HP Desktop Mini, HP Thin Client or HP Chromebox.